The oldest surviving wood fort in New England, this 1754 structure houses historic collections. 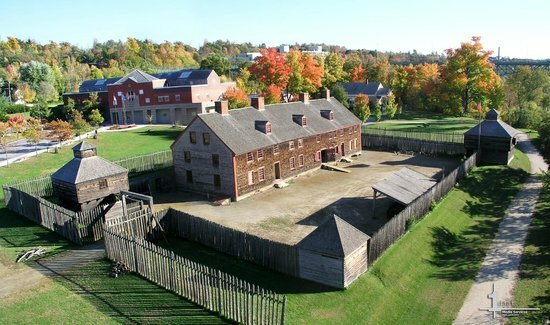 Fort Western is a former British colonial outpost at the head of navigation on the Kennebec River at modern Augusta, Maine, United States. It was built in 1754 during the French and Indian War, and is now a National Historic Landmark and local historic site owned by the city. Its main building, the only original element of the fort to survive, was restored in 1920 and now depicts its original use as a trading post. The fort and store are maintained as a museum and are open to the public during the summer months. The Fort will re-open for guided tours on Saturday, May 26th (Memorial Day weekend) from 10:00am - 4:00pm.